7,625 foot Emory Peak, the highest summit in Big Bend National Park, is relatively easy to reach by a 4.5 mile hike along well used trails starting from the busy village in Chisos Basin, center for most park activities during the long hot days of summer. 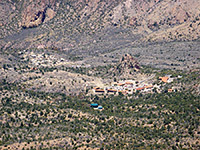 Other parts of the Chisos Mountains can be seen via several continuation paths, and there are more than 40 backcountry campsites en route to facilitate multi-day trips, but the summit hike is the quickest way to experience the rugged volcanic landscapes and reach one of the finest viewpoints in all Texas. 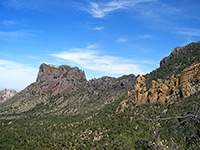 The route is along the Pinnacles Trail for 3.5 miles, up to the rim of the basin, followed by the one mile Emory Peak Trail to the summit, from where the 360° panorama encompasses a vast area of Chihuahuan Desert lands (see 360 degree panorama), all across the national park and far south into Mexico. Because much of the 2,420 foot ascent is up wooded, north-facing slopes, the path is in shadow for much of the morning, sheltered from the wind by the encircling cliffs; only the last part is more exposed, and in favorable weather conditions the round trip can be done in about four hours. 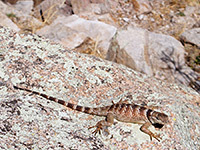 Wildlife likely to be seen in the Chisos Mountains include lizards, snakes, mule deer and whitetail deer, though the peaks are also home to black bears and mountain lions (around 10 to 15 of each), and several encounters are reported each year. Emory Peak and Chisos Mountains topographic map, Big Bend National Park location map. 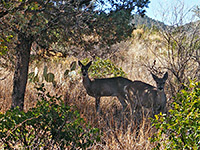 14 views along the trail to Emory Peak. Panorama from the summit of Emory Peak. All paths in Chisos Basin begin from the west side of the central parking area, near the visitor center, cafe, lodge and other facilities. The Pinnacles Trail forks left at the first junction, next to an information board and map, then left again soon after (right is the Basin Loop Trail), heading generally south towards the vertical volcanic cliffs forming the edge of the basin; Emory Peak is in view directly ahead, the highest point on the horizon. A spur road is passed on the left side, followed by a water tank and then the second intersection with the Basin Loop, as the wide, dusty Pinnacles Trail climbs fairly gently but constantly for 2 miles, through mixed woodland of bushes, pinyon pine, oak and juniper, interrupted by occasional grassy clearings. 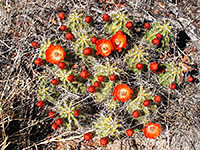 Yucca and cacti grow amongst the trees, most conspicuous being echinocereus coccineus (claret cup cactus), which form big clusters and produce brilliant red flowers in late spring. Eleven backcountry campsites along the way are reached by short, signposted side trails; after the last (PI1), the route veers due west along the base of the cliffs and the gradient increases, until, after a short level stretch, the steepest part of the climb begins, ascending via switchbacks up a near vertical hillside. 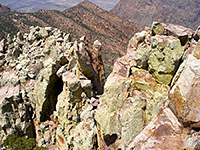 The rocks have nice reddish-brown colors, garnished with yellow and orange lichen, part of a long line of cliffs that extends northeast, forming the edge of the inaccessible Toll Mountain and Casa Grande Peak. The Pinnacles Trail arrives quite abruptly at the top of a saddle between Emory Peak and Toll Mountain, then descends a little down a ravine through thick woodland, leading to the sheltered Boot Canyon, home to the tallest trees in the mountains. The Emory Peak Trail soon forks right, climbing steeply up a woody slope (a section realigned in 2010, reducing the gradient slightly and making the route less prone to erosion) followed by a less sharp ascent through bushes and a traverse of an open hillside - rocky, exposed terrain that can be quite hot in summer. The summit is now clearly visible ahead, topped by radio masts, solar panels and other equipment. The last section of path is up a grassy slope and through a belt of trees, ending with a short scramble up a rock face to the summit, from where ridges extend west and southeast - narrow, jagged and covered with green and yellow lichen. The radio masts interrupt the panorama somewhat but do not spoil the fantastic views, which on a clear day extend up to 100 miles in some directions. The Rio Grande can be traced all the way from Santa Elena Canyon, through the remote Marsical Canyon and into Boquillas Canyon, behind which are the Sierra del Carmel Mountains and many other far-off ranges in Mexico. In the near ground, the forested South Rim is just over one mile south and 500 feet below, crossed by several trails, their course evident as thin lines through the trees..